Everyone knows about the Angeles Verdes (Green Angels). 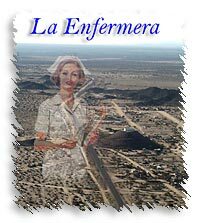 But it seems only a privileged few have encountered La Enfermera (The Nurse). As the story goes, she was once a nurse employed at the Centro de Salud in San Felipe. One evening, after her shift, she attempted to drive to Mexicali in order to attend a child's birthday party. At Laguna Salada she fell asleep behind the wheel, her car overturned and she was killed. Legend has it she now patrols the highway, stopping for stranded cars to offer assistance. Witnesses have described her either as a gringa (an American,) or a Mexicana. This story was sent in by Juliet Vega, a San Felipe resident. On that particular night we driving back to San Felipe from the US. were not blessed with a full moon so it was pitch black. My husband, Mr. Jesus Vega, has a weakness for For Sale signs. At Campo de Mosqueda there is almost always something for sale and that night my husband pulled over and parked along the shoulder of the highway to investigate a Jeep with a se vende sign on it. I was a little nervous and as he stepped out of the car, I tried to warn him about Vicious Dogs and Ravenous Coyotes. But he went anyway. As I was waiting for him to return, I saw in the mirror a car approach and pull up behind me. A woman dressed as a Nurse stepped out. By then, Jesus was running back to see what was happening. The woman went to the driver side and asked through the open window, "Do you need help? Is your car broken?" I told her no, my husband was just checking out a car for sale. As Jesus approached, the nurse told him she stopped because she thought we were having difficulty. She added that she had been driving the highway for thirty years, rescuing people in distress. Back on the highway, we both agreed she was a bit strange and tried to laught it off. After a few mintues, we lost sight of her lights behind us. Some time later, Jesus and I both heard Nature's Call, which required us to pull over and search for an appropriate bush along the side of the highway. After our business was finsihed and we stepped out from behind the bush, we were shocked to see the Nurse parked in front of our car. I was amazed, as we never saw her lights behind us and no one had passed us. She approached again and asked us if we had broken down. We told her we were OK. Just a toilet break. I asked the Nurse her name but she did not respond. She did say she was renting a site at the Mar del Sol RV Park, next to Las Misiones Hotel. I noticed her car had an Oregon license plate. I watched as she got back into her car and drove away into the night. What a fearless woman, I thought. The next day I went to Mar del Sol, but she was not registered there nor could I locate her car. Two days later I shared the experience with a local at the laundromat. The owner began to pray fervently and declared I had met La Enfermera.